This chapter contains some infrequent errors you may encounter and solutions to them. In the case of installation of CloverDX Designer on Microsoft Windows 8 the installer may be prevented from starting by SmartScreen. To start the CloverDX Designer installer click on More info, check that the publisher is CloverDX a.s. and then click on Run anyway. 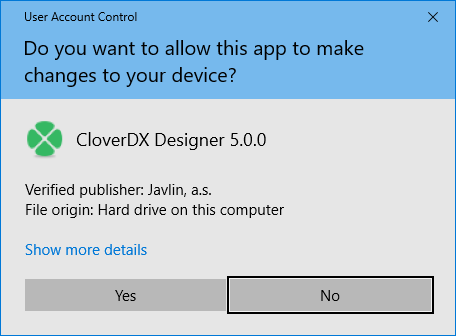 On Microsoft Windows, the User Account Control can prevent the installer of CloverDX Designer from running. Click YES to allow the installer to run. Windows 10 shows security warning when Designer's Runtime is starting. CloverDX Designer application starts as two processes: CloverDX Designer GUI and CloverDX Runtime. These processes need to communicate with each other over TCP protocol. You should allow the mutual communication with Allow access button. Due to bug in Linux/GTK+, Designer runs out of number of open files as the backend opens the file /etc/cups/client.cont many times. As workaround, you can configure the printers in /etc/cups/client.conf file, or add -Dorg.eclipse.swt.internal.gtk.disablePrinting to CloverDX.ini file. See https://wiki.eclipse.org/IRC_FAQ#Why_does_Eclipse_hang_for_an_extended_period_of_time_after_opening_an_editor_in_Linux.2Fgtk.2B.3F, https://bugs.eclipse.org/bugs/show_bug.cgi?id=215234 or https://bugzilla.gnome.org/show_bug.cgi?id=346903. Welcome page requires webkitgtk library to be present on your system. Install webkitgtk version 1. If hints on edges contain only the frame but no content, you should install webkitgtk. In older Linux versions (e.g. Ubuntu 16.04 MATE or Linux Mint 18 Cinnamon), Eclipse platform may experience some problems related to the system's GTK version. For example, when using GTK 2, the component editor in CloverDX Designer may not work properly. This parameter forces CloverDX Designer to run using GTK 2 which may fix the problem. Note: do not use the parameter on systems using GTK 3 (e.g. Manjaro with KDE Plasma 5), as it may cause other problems (e.g. non-functional tooltips in the graph editor). An exception has been caught while processing the refactoring 'Rename resource'. Problems encountered while moving resources. Error deleting markers for resource bbb. Resource aaa does not exist. This problem is caused by caching resources by the Subclipse plugin an has nothing to do with CloverDX. If this message appears, refresh the project in Navigator.